Brass instruments are very common in western music. They are used in school bands, marching bands, symphony orchestras and jazz bands. They are a particular family of instruments that have certain characteristics that differentiate them from the woodwind, strings and percussion families. These characteristics help to determine their size, shape and tone quality. All brass instruments share the same type of mouthpiece. The mouthpieces will vary in size based on each particular instrument. A tuba requires a larger mouthpiece than a trumpet, but they are the same shape. Mouthpieces come with different tube lengths that allow for higher or lower pitches. The longer the tubing, the higher the player can play. For more information on selecting mouthpieces, please check the link in Resources. Valves are used to create different pitches in brass instruments. Each brass instrument has three valves that are pressed to vary the length of the brass tubing that creates different pitches. The exception to this is the trombone, which uses a slide to vary the length of the tubing and to make different pitches. Different pitches are created by pressing any combination of the three valves and by changing the amount of air that the player is using. Brass instruments are played by setting the mouth in a particular position known as the embouchure. Each mouthpiece produces sound by having the player "buzz" his lips. This creates vibration that goes through the mouthpiece and into the instrument. Variations can be made by adjusting the mouth within the mouthpiece and by adjusting the amount of air produced. Tighter lips and faster air will produce a higher sound. Less air will produce a lower sound. This also affects tone quality and pitch accuracy. The harmonic series is created when the musician shortens or lengthens the sound waves to make different pitches. Brass instruments use the harmonic series to create all of the different pitches. This is achieved by pressing the correct combination of valves and setting the embouchure to create the correct amount of air flow. 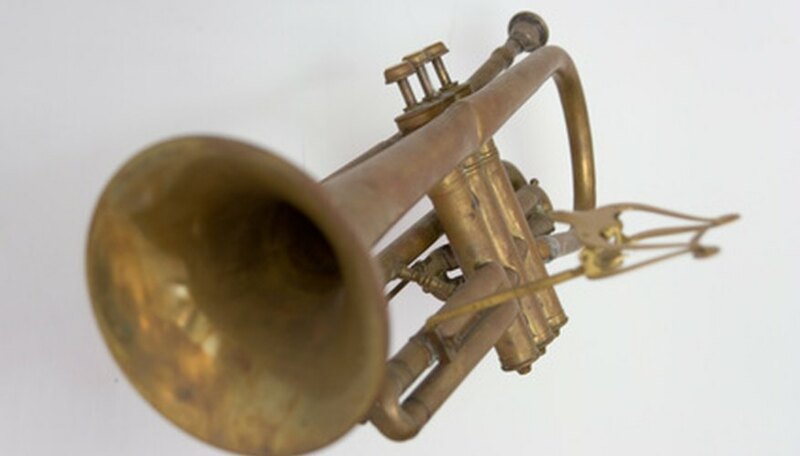 For example, if a trumpet player is playing one pitch but then sends faster air through the horn, it will play a series of harmonic pitches depending on how fast the air is. Emily Pence has been writing since 2008. Specializing in all things musical, her work appears on eHow. Pence is a full-time high school music teacher and singer in numerous professional choirs. She holds a Bachelor of Music in music education from Rutgers University and is pursuing a Master of Arts in music education at Florida State University. How Does a Saxophone Produce Sound?